Aksel Lund Svindal won the men’s downhill on Thursday, making the 35-year-old Norwegian the oldest Olympic gold medalist in Alpine skiing. 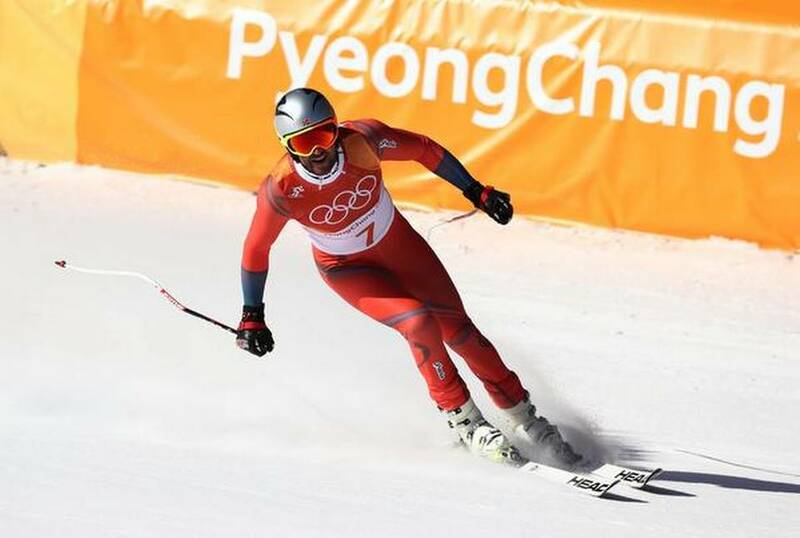 Svindal was 0.12 seconds faster than Norway teammate Kjetil Jansrud down the 1-4/5-mile (2.9-kilometer) course at Jeongseon. Beat Feuz of Switzerland took bronze, 0.18 behind Svindal’s time of 1 minute, 40.25 seconds. The race started in near-perfect calm and cold conditions four days after it was postponed due to fierce winds that made racing unsafe. It was 34 degrees Fahrenheit (1 degree Celsius) under sunshine and blue skies broken up by a few wispy clouds. In a race that often has a surprise winner, the new Olympic champion has been the most consistent downhill racer over the past decade despite a series of severe injuries. IN fact, the three medalist were the most touted pre-race favorites. Jansrud took downhill bronze four years ago and Feuz is the current world champion. Svindal got silver in downhill at the 2010 Vancouver Olympics, and was fourth at the 2014 Sochi Olympics. He also won world championship gold medals in downhill in 2007 and 2013. Now, after turning 35 in December, he is three months older than Austria’s Mario Matt was in 2014 when winning the Olympic slalom. The oldest Olympic medalist in Alpine racing is American Bode Miller, who was 36 when taking bronze in super-G at the Sochi Games. Svindal excelled on the bottom half of the Jeongseon course after some uneasy moments early in his run. The snow conditions seemed faster than in training runs, and Svindal worked hard to find the best racing line. He took a tight angle across a tricky side hill, went wide at one turn, and fought through the air off one big jump. The big Norwegian trailed Feuz by 0.23 at halfway then mastered the lower section. Svindal punched his left arm air in the finish area upon seeing the clock and the green light next to his name. The only time in the race he had led was the one that mattered. Jansrud started three minutes later on a course where he won the only previous downhill, an Olympic test on the World Cup circuit two years ago when Svindal was injured. Ahead at four straight time checks, Jansrud’s lead steadily dropped from 0.43 and he was twisted sideways in midair before landing one jump. He still had 0.04 in hand heading into a twisting approach to the final jump. Jansrud threw his head back in anguish when he saw his time. Feuz, the in-form downhiller in 2018, was unbalanced early in his run. Racing before the Norwegians, he smiled wryly for the television cameras at the finish and wiggled his right hand as if acknowledging his leading time would not hold up. No man has ever retained the Olympic downhill title and defending champion Matthias Mayer’s chance was gone soon after halfway. The Austrian racer finished 1.21 behind Svindal in ninth place.